If you're new at making tarts, this is definitely the perfect recipe to try out, because it's practically fool-proof. I used to have an aversion to making tarts and pies, mostly because I used to hate making the pastry dough. Most pastry doughs out there calls for cold butter, ice-cold water and minimal handling, and often than not, my doughs turned out crumbly and dry, making it impossible to roll them out and lay them out in my pan nicely. 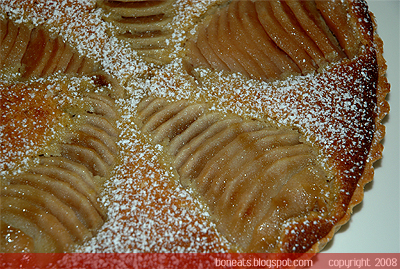 However, I've made this tart recipe numerous times now, all of which were successful. The recipe calls for room temperature butter, a mixer, the creaming method and no refrigerating prior to rolling out the dough. What you get is a soft but very easy to handle dough that rolls out beautifully, and more importantly, comes out of the oven rich, buttery and tender. The combination of almonds and pears is incredible; for some reason, the scent and flavour of pears just goes so well with almonds. But then again, almonds is such a versatile nut that can go with just about anything, and with that said, it makes this tart just as flexible with a number of fresh fruits that is available during a particular season. You can substitute the pears with fresh figs, plums, peaches, apricots, apples, or as I have done in the past, cherries. What's that you say? It's the dead of winter and impossible to find some fresh, beautiful fruit? This can just as easily be made with canned pears or peaches, as long as you make sure to drain the fruit well before topping it on the tart. 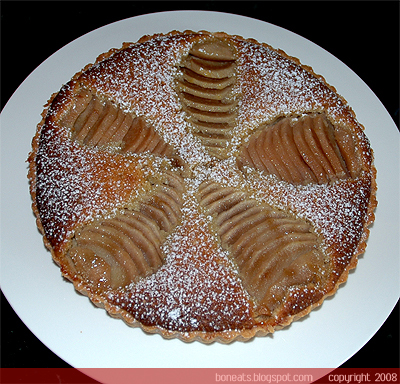 For this tart, I used forelle pears, since they are in season at the moment. 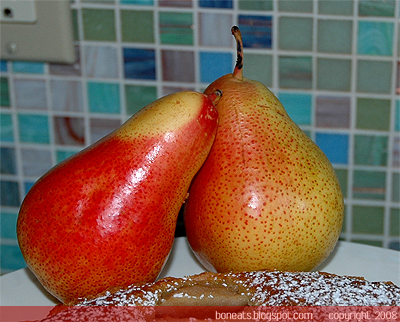 They are a sweet pear, although not as fragrant and juicy as other varieties like bartlett. Bosc or Anjou pears are usually preferred for poaching or baking because they are of the firmer variety, and tend to keep their shape better even after being exposed to heat. However, you can just as easily use other varieties of pears as long as you make the proper adjustments in the cooking process to ensure that you pear doesn't end up as mush. I love how this tart looks after it comes out of the oven. 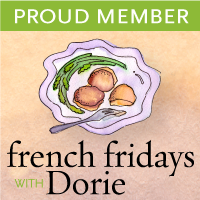 It's such a simple dessert, but the fanned pears just makes for a beautiful presentation. Dust with a bit of confectioners' sugar just before serving and this is fit for company. Trust me, if you want to get over your fears of making tarts, definitely give this recipe a try. Not only is it super-easy, but it's absolutely delicious and it'll have you making this tart over and over again. Posted by Bonita at 4:19 p.m.